Radiator Blog: Balls and conversation; let's narrativize the sports genre. Balls and conversation; let's narrativize the sports genre. The mechanics in baseball video games usually work like this: the pitcher chooses between a fastball, a slower pitch (change-up), or one that rapidly sinks / curves (breaking ball). The batter tries to predict the trajectory of the pitch to hit it. Both players try to fake each other out. It's rock paper scissors with a heavy element of timing. 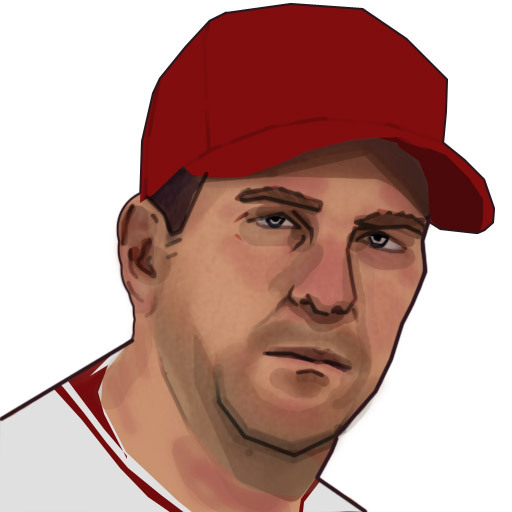 However, I'm making a game about a specific pitcher named Troy Percival, and Percival rarely threw slow pitches. In fact, he pretty much only threw fastballs -- but they were deadly, among the speediest fastballs in the history of the sport. Bases loaded, Jeter at the plate? Percy threw fastballs. So here's the conflict: there are deeply ingrained genre conventions about the meaningful choices I'm supposed to offer to the pitcher (fast, slow, break) but my game narrative is about one pitcher's career and world view, who threw only fastballs like 99% of the time. If this is truly a game about Percival, it has to have systems / level design that encourage you to perform like Percival and understand the character's mindset. How do you resolve ludonarrative dissonance in the sports genre? To Percival, the other pitches were suboptimal, so why should I bother designing them or including them if they're just traps? Now I'm making a baseball game where you can only throw fastballs, and the "strategy" involves something else. Is that still operating in the tradition of the baseball game? At what point is it more of a sidescroller with a pitching mechanic than a baseball game with sidescrolling? Like any other medium of performance, baseball can serve as a lens to understand something outside of baseball. The most common themes in baseball films are: the fallout of failure, aging, parenthood, modern masculinity, and race. 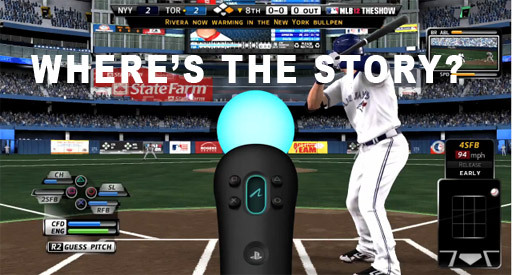 That's compelling stuff... that isn't present in a single baseball video game. What is baseball's place in American culture? Don't ask MLB 12: The Show; that product would rather tell you about this year's cover athlete or the new Mars Volta song on the soundtrack. So, I think we should narrativize the sports game genre. I'm a guy who loves baseball films and enjoys going to baseball games and drinking a bunch of beer, but I hate "following" baseball and the emphasis on statistical trivia -- which makes me a less authentic baseball fan? No other video game genre operates this way. A Halo fan can love it for the combat, or maybe love it for the narrative / lore, or maybe both or neither, and that's okay. I want to carve out a space for people like me, who love the narratives of things in places where narrative is locked in the basement and fed fish heads once a week. Every major sport has a compelling political / cultural context that their games never investigate. Imagine the first person genre, except literally the only FPS released each year is another Call of Duty that denies it has any political context and insists it's "just a game" -- and that's the state of the sports game genre right now. But what if we go further -- like, into crazy territory -- what if you mixed American football with Dear Esther? How great would a Friday Night Lights / Twin Peaks video game be? Or a hockey game where the opposing goalies are secret lovers. An Olympics game where you can plant contraband in the Chinese womens gymnastics team's locker room and get them disqualified, then wake up the next morning to the Chinese mafia smashing through your window? A tennis game where you have tense, argument-filled brunches with your doubles partner, who throws their mimosa in your face? Let's take a page from the guns and conversation genre, and let's go for balls and conversation. PS: if anyone knows of any sports games with narrative, please bring them up in the comments! PPS: Moneyball sucked. Way too mechanical in its plotting -- "this is the scene where Brad Pitt bonds with his daughter and where we introduce An Important Symbol." Narrativization can easily go awry.